No more worries about your busy schedule, kids needing to be places, fetching groceries or shopping trips. This bike’s speed and agility will be more than a match for your busy lifestyle. Urban Arrow’s wide range of accessories will allow you to customize it to meet your family’s needs. Say goodbye to the car while you confidently maneuver your way through traffic. The structural aluminum frame, powerful Bosch pedal assist and seamless gear shifting guarantee a very pleasant riding experience. It is cycling the way you are used to, with agility and comfortable stability, but now with passengers and cargo! In addition to a superbly engineered bike, Urban Arrow’s broad accessory range was created by carefully listening to riders. With the optional extra front bench, rain cover or Maxi-Cosi adapter you can tune your bike to match your family’s needs. The rain cover keeps everything nice and dry during bike rides on rainy days. Thanks to this extra bench, your kids’ friends are always welcome to come along for the ride. Safely bring your baby along with the Maxi-Cosi seat adapter. Suspension has been added to ensure the smoothest possible ride for your little one. Thanks to this poncho, you’ll have no more excuses to take the car. You can even connect this poncho with the Rain Cover to stay dry at all times. Increase the load capacity of your Urban Arrow with a rear rack compatible with most kid seats and rear panniers. Available in black and white. Fits both Urban Arrow Family & Shorty. 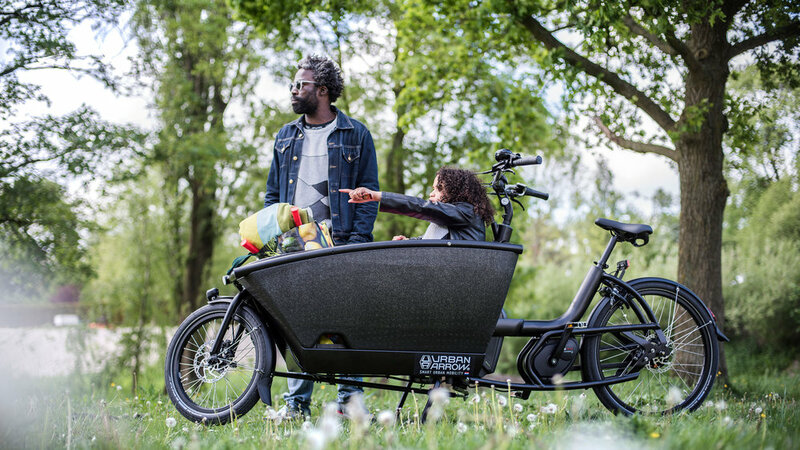 Increase the load capacity of your Urban Arrow Family with a rear rack compatible with most kid seats and rear panniers. Available in black and white. This parka will protect your Urban Arrow Family from the elements when parked outside. When not in use, it folds into a compact pouch. The box cover neatly covers your cargo area when it’s not in use, protecting against rain and urban detritus. Ideal for carrying small, loose items in the Urban Arrow Family cargo box. Prevents items from rattling around or causing damage. A porous, lightweight floor mat that will protect your cargo, and also protect your bike from your cargo. Powered by Bosch. Choose a Performance or Performance CX motor with a 400Wh or 500Wh battery for miles of smiles. Easy Entry. To make it easier for your kids to climb into the Family, we’ve created a special step on both sides of the box. Unique Materials & Design. Closed cell foam cargo/kid box provides safety protection and insulation while being light weight. Enviolo N380 Gear System. The N380 makes for effortless gear transitions and plays extraordinarily well with the Bosch system. Accessorize! Deck out your Urban Arrow with some of the very well thought out accessories. 26”/20” Wheels. A larger rear wheel absorbs road vibration, and a smaller front wheel passenger weight low. Weight Matters. Family Bike weighs in at under 50kg, or right around 100 lbs. Urban Arrow offers a 5 year warranty against manufacturing and material defects to the frame, 2 years for the drive system, and 1 year for the components with the exception of parts subject to daily wear and tear, such as tires, tubes, and chain. Damage resulting from misuse, abuse, and normal wear and tear is not covered. The warranty is only valid for the original purchaser of Urban Arrow bikes or accessories.